On the second level, this 40 X 80 room is the perfect place to host your wedding dinner and reception, annual meeting, conference, banquet or gala dinner. 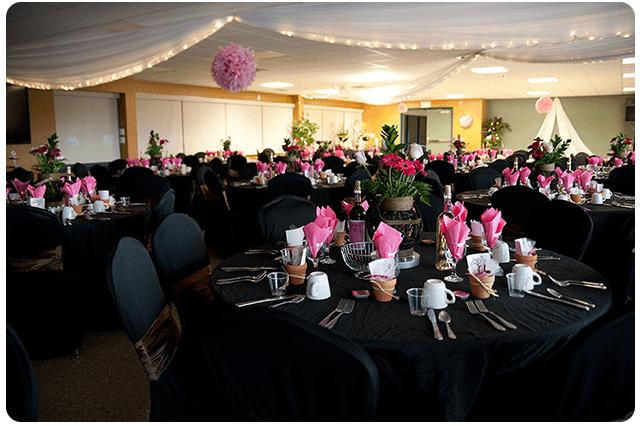 With an in-house catering kitchen, a fully loaded bar, dinner and glassware for up to 300 people, table cloths, cloth napkins, two (commercial grade) high chairs, round tables (seating up to eight), and dressy seating, the North Sydney Credit Union Community Room is sure to meet all of your needs. The room has an 80-inch TV available for your PowerPoint presentation or video. We also have an in-house PA and podium with built-in microphone. Maximum occupancy of 240 people. Rate: Without bar open, $50 per hour. No set-up or clean-up fee. With bar open, there is a $50 optional set-up fee and a $75 mandatory clean-up fee, and the $50 per hour rate is waived.